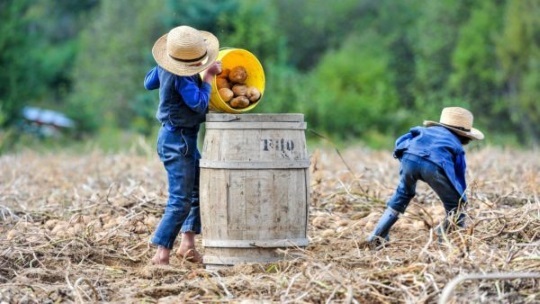 The Amish community at Fort Fairfield, Maine is turning 10 years old, and Bangor Daily News has an article on the community with comments from founder Noah Yoder. With his wife and 11 children, Yoder moved to the area from upstate New York as the settlement’s first family in August 2007. We have looked at this settlement once before in 2013, following a piece in Down East magazine. If the two reports are accurate, the community has grown quite a bit since that time, with 20 families in 2013, and now 30-plus. The Fort Fairfield area is about as far up as you can go in Maine, with the Canadian border just a stone’s throw away. Aroostook County itself is home to several other Amish settlements, including the state’s oldest at Smyrna Mills. Aroostook is known in the state simply as “The County” due to its massive size. In fact it’s the largest county measured by land area east of the Rockies, and is larger than 3 states (Connecticut, Delaware, and Rhode Island). When the Yoders were considering leaving New York and settling around Presque Isle — an area Yoder thought would have promise — they met Milo Hilty, the head of an Amish family in Smyrna, and were discouraged from looking farther north. “He said it was too far away from everything and he kind of pointed us back downstate,” Noah Yoder said. “We looked around southern Maine for a long time and couldn’t find anything that quite attracted us. Local Amish farm and run businesses including furniture making, pallets, bakeries, and sawmills. “We can’t live like my grandfather did in today’s world. But we still like to keep the old tradition,” Miller said. Some conflict over road manure and tax evaluations on barns notwithstanding, relations with non-Amish are good here. 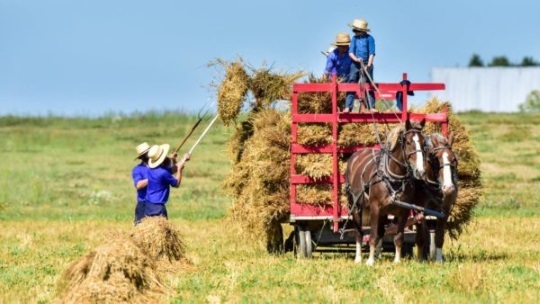 And the Amish seem happy – even with the disliked long winters, none have left the community, which seems noteworthy after a decade. And all the more so, when there are many historical examples of Amish settlements coming and going in a matter of just a few years (or even less). Read the article in full here (there are also several more nice photos). It’s always nice to hear of a new Amish community that’s actually thriving. I’d like to know how the “locals” (non-Amish) have helped their new Amish neighbors adapt and survive there. Long winters can grate on everyone’s nerves, and I would imagine it being more difficult in a Swartzentruber community. I wish them continued prosperity. I hope we re-visit this community over the years to track their (hopefully) progress. This was an interesting article about a settlement so far from any others. The Swartz. 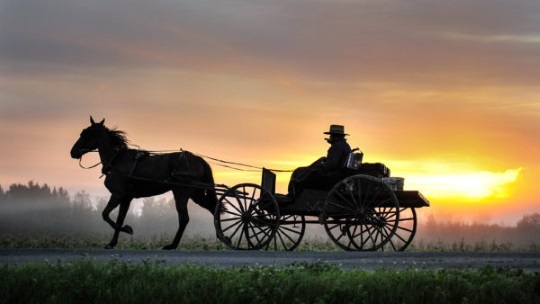 Amish I know are very active in traveling via bus or train to other settlements for weddings, funerals, visiting relatives, etc. I wonder if the Swartz. Amish at Fort Fairfield do as much traveling. It is great to see a new community thrive. I too would enjoy fiture updates of this settlement. The Amish in my area too, have grown quite. But in the last 5 years. We didn’t really know of any in our immediate area, but we now have a few that are “close” neighbors. I forget, but I thought I last heard they have around 30 families now? We are in/near the Becker County, MN settlement. Quite a bit in my area is what I meant to type! Interesting Genevieve, thanks for sharing. For some reason my email comment notifier was not working this past week, so missed these. I drive a bus for Trailways. 5 days a week I travel from Syracuse to Potsdam and Massena. I pass by Noah’s home in DeKalb Junction twice a day. Recently he rode with, not the first time, on his way to Maine. I also brought him on the last leg of his trip home. The bus was not crowded and he sat up front. So we had a pleasant conversation for part of the trip in both directions. Such a small world. Neat to hear that Ronnie. Noah seems like he’d be an open and pleasant to speak with fellow. Happy travels!